A high profile Brookings Institution senior fellow participated Sunday in a national gathering outside Washington, D.C. of an anti-Israel group which pushes for a boycott and economic divestment from the Jewish state. 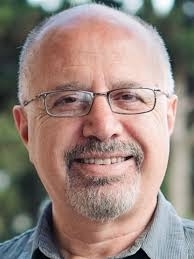 In addition to his role with Brookings, Shibley Telhami is the University of Maryland's Anwar Sadat Professor for Peace and Development. In 2014, the Investigative Project on Terrorism examined the Brookings Institution's close ties with the terror-supporting Gulf state Qatar, which has given the think tank millions of dollars over the years. Brookings, in turn, routinely gives voice and legitimacy to radical Islamists including those who advocate for Hamas, and hedges on censorship and blasphemy law campaigns by Muslim countries which are part of the Organization of Islamic Cooperation. In his comments Sunday, Telhami made no endorsement of the Boycott, Divestment, Sanctions (BDS) campaign, but summarized polling he did during the past year on American attitudes on U.S. policy in the Israeli-Palestinian conflict. Increasingly, he said, there's a partisan divide, with data showing Democrats are more likely to want the U.S. to be even-handed rather than favor Israel or the Palestinians. When it comes to United Nations votes on establishing a Palestinian state, 53 percent of Republicans want the United States to continue voting against it. But only 19 percent of Democrats would want the U.S. to vote against it. More than 80 percent of Democrats say they favor Israel's democracy over its status as a Jewish state. A majority of Republicans, 57 percent, agreed. Telhami does not ask specific questions about BDS in his polls, he said in a December interview. While Telhami took no position about the conference's mission, his presence granted legitimacy upon the US Campaign and its mission. That mission includes isolating Israel politically and economically by pushing for a boycott on Israeli products and academic cooperation and pressuring corporations and universities to divest from companies doing business in Israel. In doing so, the US Campaign remains silent about Hamas's rejection of any peaceful settlement to the conflict, a position established in its anti-Semitic charter which also calls for Israel's annihilation. Hamas officials reiterate that position often. The US Campaign also ignores provocations by Hamas, including its policy of diverting supplies and money that could be used to improve life for Palestinians in Gaza in order to build attack tunnels into Israel and to rebuild its rocket arsenal in preparation for future conflict. The organization also ignores offers to create a Palestinian state that were rejected by Palestinian Authority leader Yasser Arafat in 2000 and Mahmoud Abbas in 2008. The 2008 Israeli offer included a near total withdrawal from the West Bank and the elimination of Israeli control of East Jerusalem, including the Old City, which would be given to an international authority. This one-sided approach prompted the United Methodist Church to withdraw from the US Campaign to End the Israeli Occupation last May. "Blaming only one side while ignoring the wrongdoing of Hamas, Hezbollah, and Iran will not advance the cause of peace," the Methodist petition said. The campaign's executive director, Yousef Munayyer, hosted Telhami's panel. 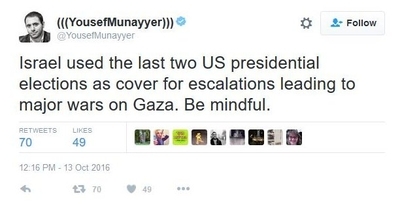 Munayyer is a buttoned-down, reasonable sounding apologist for Hamas. After a contentious appearance on Fox News during the 2014 Gaza war, Munayyer said that "Hamas is a resistance movement that has used tactics that we all agree are terror tactics. But they're not only a terrorist organization; they're a resistance movement, they're a political organization, they're a social services organization, and I don't agree with the use of the word 'terrorism' to just hijack conversations." Last week, Munayyer warned his Twitter followers that the periods just before U.S. elections are used by Israel as cover to launch unjust attacks against Palestinians in Gaza. In doing so, he ignores the thousands of rockets Hamas launched into Israeli civilian communities and their role in triggering conflicts in late 2008 and during the summer of 2014. Telhami's polling can be useful for people on all sides who may be passionate about the issue. But his decision Sunday to give legitimacy to a group which pursues actions carrying no hope of making peace more likely was a poor one. A poll among the United Methodist Church earlier this year made that clear.